Updated - June 26, 2007, 1 p.m.
Seymour Hersh broke the story of CIA's illegal domestic operations with a front page story in the New York Times on December 22, 1974. "Files on Illegal Spying Show C.I.A. Skeletons From Cold War"
"CIA Releases Files on Past Misdeeds"
By Karen DeYoung and Walter Pincus"
"CIA Releases 700 Pages of 'Family Jewels'"
"CIA to Air Decades of Its Dirty Laundry"
"CIA Kidnapping, Wiretapping of '60s, '70s Revealed"
"C.I.A. to Release Documents on Decades-Old Misdeeds"
Lawsuit calls CIA secrecy claims "facially incredible"
"C.I.A., Breaking Promises, Puts Off Release of Cold War Files"
Update - June 26, 2007, 1 p.m. - The full "family jewels" report, released today by the Central Intelligence Agency and detailing 25 years of Agency misdeeds, is now available on the Archive's Web site. The 702-page collection was delivered by CIA officers to the Archive at approximately 11:30 this morning -- 15 years after the Archive filed a Freedom of Information request for the documents. The report is available for download in its entirety and is also split into five smaller files for easier download. ALL FILES NOW FULL TEXT SEARCHABLE! Top Ten Most Interesting "Family Jewels"
Today's release also includes a substantially-excised version of a memo first released 30 years ago in 1977 with fewer excisions (see comparison below). Update - June 26, 2007, 11:00 a.m. - The Central Intelligence Agency has promised to deliver the long-secret "family jewels" report to the Archive within the hour. The complete report, as released by CIA, will be posted here as soon as we can scan it. In the meantime, the Archive has posted the original memorandum, signed by then-CIA director James R. Schlesinger, ordering the "family jewels" study and calling on CIA employees to report to him any activities "which might be construed to be outside the legislative charter of this Agency." Washington D.C., June 21, 2007 - The Central Intelligence Agency violated its charter for 25 years until revelations of illegal wiretapping, domestic surveillance, assassination plots, and human experimentation led to official investigations and reforms in the 1970s, according to declassified documents posted today on the Web by the National Security Archive at George Washington University. CIA director Gen. Michael Hayden announced today that the Agency is declassifying the full 693-page file amassed on CIA's illegal activities by order of then-CIA director James Schlesinger in 1973--the so-called "family jewels." 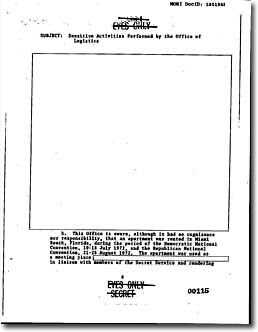 Only a few dozen heavily-censored pages of this file have previously been declassified, although multiple Freedom of Information Act requests have been filed over the years for the documents. Gen. Hayden called the file "a glimpse of a very different time and a very different Agency." The papers are scheduled for public release on Monday, June 25. "This is the first voluntary CIA declassification of controversial material since George Tenet in 1998 reneged on the 1990s promises of greater openness at the Agency," commented Thomas Blanton, the Archive's director. Hayden also announced the declassification of some 11,000 pages of the so-called CAESAR, POLO and ESAU papers--hard-target analyses of Soviet and Chinese leadership internal politics and Sino-Soviet relations from 1953-1973, a collection of intelligence on Warsaw Pact military programs, and hundreds of pages on the A-12 spy plane. 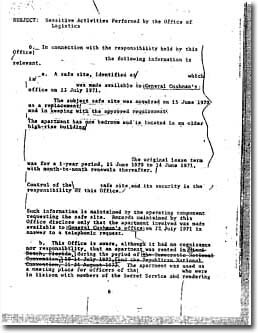 The National Security Archive separately obtained (and posted today) a six-page summary of the illegal CIA activities, prepared by Justice Department lawyers after a CIA briefing in December 1974, and the memorandum of conversation when the CIA first briefed President Gerald Ford on the scandal on January 3, 1975. Seymour Hersh broke the story of CIA's illegal domestic operations with a front page story in the New York Times on December 22, 1974 ("Huge C.I.A. 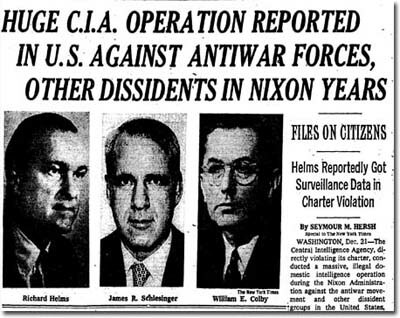 Operation Reported in U.S. Against Antiwar Forces, Other Dissidents in Nixon Years"), writing that "a check of the CIA's domestic files ordered last year… produced evidence of dozens of other illegal activities… beginning in the nineteen fifties, including break-ins, wiretapping, and the surreptitious inspection of mail." 1. Confinement of a Russian defector that "might be regarded as a violation of the kidnapping laws." 2. Wiretapping of two syndicated columnists, Robert Allen and Paul Scott. 3. Physical surveillance of muckraker Jack Anderson and his associates, including current Fox News anchor Brit Hume. 4. Physical surveillance of then Washington Post reporter Michael Getler. 5. Break-in at the home of a former CIA employee. 6. Break-in at the office of a former defector. 7. Warrantless entry into the apartment of a former CIA employee. 8. Mail opening from 1953 to 1973 of letters to and from the Soviet Union. 9. Mail opening from 1969 to 1972 of letters to and from China. 10. Behavior modification experiments on "unwitting" U.S. citizens. 11. Assassination plots against Castro, Lumumba, and Trujillo (on the latter, "no active part" but a "faint connection" to the killers). 12. Surveillance of dissident groups between 1967 and 1971. 13. Surveillance of a particular Latin American female and U.S. citizens in Detroit. 14. Surveillance of a CIA critic and former officer, Victor Marchetti. 15. Amassing of files on 9,900-plus Americans related to the antiwar movement. 16. Polygraph experiments with the San Mateo, California, sheriff. 17. Fake CIA identification documents that might violate state laws. 18. Testing of electronic equipment on US telephone circuits. On New Years' eve, 1974, DCI Colby met with Justice Department officials, including Deputy Attorney General Laurence H. Silberman, to give them a full briefing of the "skeletons." Ten days after the appearance of Hersh's New York Times story, DCI William Colby tells President Ford how his predecessor James Schlesinger (then serving as Secretary of Defense) ordered CIA staffers to compile the "skeletons" in the Agency's closet, such as surveillance of student radicals, illegal wiretaps, assassination plots, and the three year confinement of a Soviet defector, Yuri Nosenko. An apoplectic Kissinger argues that the unspilling of CIA secrets is "worse than the days of McCarthyism" when the Wisconsin Senator went after the State Department. Kissinger had met with former DCI Richard Helms who told him that "these stories are just the tip of the iceberg," citing as one example Robert F. Kennedy's role in assassination planning. Ford wondered whether to fire Colby, but Kissinger advised him to wait until after the investigations were complete when he could "put in someone of towering integrity." The "Blue Ribbon" announcement refers to the creation of a commission chaired by then-vice president Nelson A. Rockefeller. Cabinet and sub-cabinet level officials led by Kissinger discuss ways and means to protect information sought by ongoing Senate (Church Committee) and House (Pike Committee) investigations of intelligence community abuses during the first decades of the Cold War. Worried about the foreign governments that have cooperated with U.S. intelligence agencies, Kissinger wants to "demonstrate to foreign countries that we aren't too dangerous to cooperate with because of leaks." Contents of this Web site Copyright 1995-2017 National Security Archive. All rights reserved. Terms and conditions for use of materials found on this Web site.